Cue the crickets along with disappointed comments in the chat pod, especially from Adobe Captivate users (Captivate has been able to publish projects as a video for years). Why would a Storyline developer want to publish a project as a video (especially when you lose any interactivity you've built into the slides)? Video files are self-contained. They can be viewed on just about any device without the need for a web browser. You can email the video output to a colleague who does not have Storyline, so they can view your slides. And published videos can be uploaded into video streaming servers such as YouTube and Vimeo. 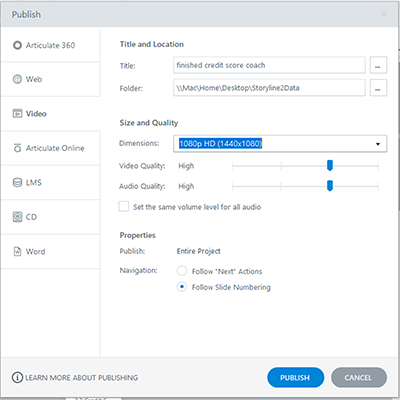 Given that publishing as a video has been a requested Storyline feature for some time, I’m happy to report that Articulate Storyline 360 now allows you to publish a single video of a Slide, a Scene, or the Entire Course. There are some settings and best practice options in the Publish to Video dialog box we’ll discuss. Dimensions. This is where you can select a size for video from a drop-down menu. If video size is not a factor, you can go as high as full 1080p HD for nice quality. You have two sliders for Video and Audio Quality that ranges from Low to Very High. There is of course a tradeoff between quality and file size. High is usually a good choice. “Set the same volume level for all audio” makes all sounds volume consistent throughout the project. If you want to keep the volume the same as you originally had it in the Storyline project, deselect this option. Prior to publishing, you can also control how the slides flow (or the Navigation). You can either follow the “next” button actions in your course, or show the slides sequentially based on their slide number (1.1, 1.2, 2.1, 2.2, and so on). If you need to publish a course to video, I suggest that you duplicate the project and prepare a copy for video output that automatically goes through all content flow without missing main content stored in layers. You’ll likely need to adjust the Triggers so they execute automatically. For example, if a user needs to click a button to show a specific layer, you can adjust the Triggers so one layer shows when the timeline of a previous layer end. Looking for Storyline training? Check out these live, hands-on, online classes. 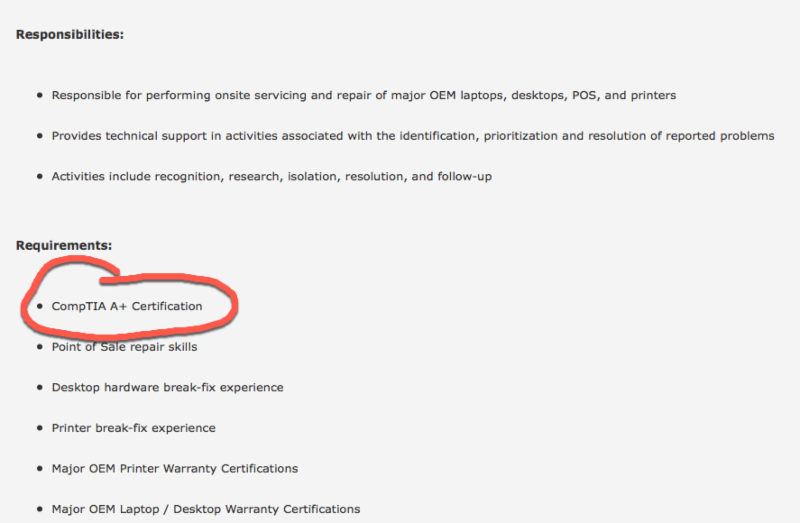 Kal Hadi, COTP, is a Certified Adobe Instructor with CompTIA CTT+ credentials. He has over 15 years of experience in the field of computer graphics, imaging, and electronic publishing. He was recognized by Adobe as one of the top five trainers worldwide in 2009. He is a graduate of the Rochester Institute of Technology Electronic Publishing graduate program. 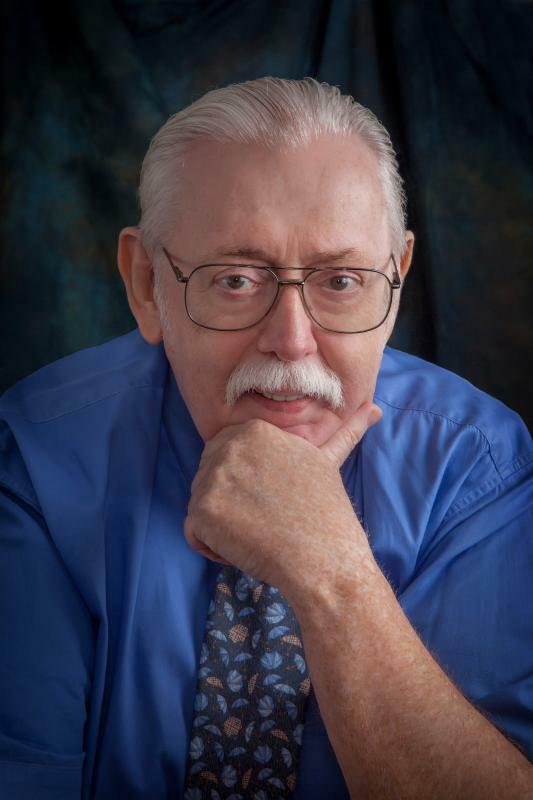 He is also the author of many books and papers in the fields of graphics and web publishing including IconLogic's Articulate Storyline books. ADOBE CAPTIVATE: It's Gotta Be Friday Somewhere! Happy Friday! Ok, maybe it's Friday when you're reading this, maybe it isn't. However, if it's not a Friday, let's pretend that it is. Are you wondering how to get Captivate to perform this little bit of magic? You could simply write the words “Hello! It’s a lovely Friday…” into a Text Caption or Smart Shape. However, the learner would only be greeted correctly once out of every seven days. Instead of manually typing the day, let Captivate share the information with your learners. Believe it or not, Captivate already knows how to get the information: via a System Variable called cpInfoCurrentDay. If you wanted to have the day show up in a text caption, all you’d need to do is type the following text and the name of the Variable. What’s that “6” doing there? Captivate did exactly what was asked. I asked for current DAY, and the 6th day of the week appeared... Friday. The reason for the confusion can be found in Captivate’s Variables dialog box (via the Project menu). The Description for cpInfoCurrentDay: “Day of the week as set on the user's computer. Values range from 1-7 starting with Sunday. Sunday=1, Monday=2, and so on.” And that explains why Friday displays as the number 6. I’m going to show you how to create a quick Conditional Advanced Action that will ensure that 6 is displayed as Friday in my current project. 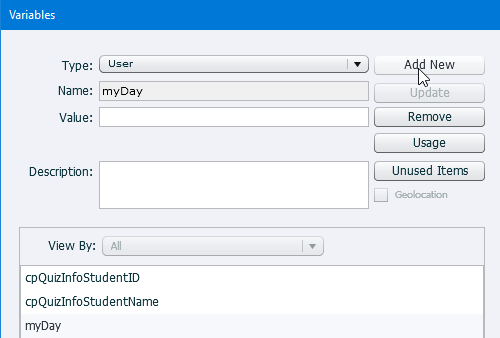 First, open the Variables dialog box and add a new User Variable called myDay. 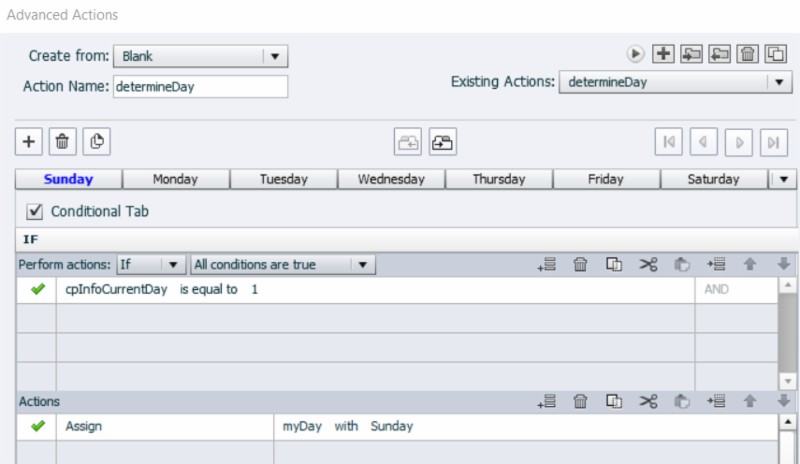 Replace the cpInfoCurrentDay variable in your caption with your new myDay variable. Be sure to create and fill in the Decision Blocks, one for each day of the week. As you create the Decision Blocks, remember to set the value for each appropriately (Sunday is 1, Monday is 2, etc. as shown in the images above and below). Like this little action? Want to learn how to create more actions like this, and more complex ones too? Join me for my Captivate Variable and Action Deep Dive series. The 101 class starts with the basics. As we move through 201, 301, and 401, we will continue to build your skills and practice with Captivate Variables and Advanced Actions. Next? We conquer the world! Meetings like this don’t work. Employees prefer hearing company information from leaders who talk with them, not to them, and engage them with authentic conversation and actions. Leaders can turn boring town hall meetings into engaging experiences that score big with employees. As communicators, it’s our job to help leaders do it well so that they increase their credibility and build trust, which helps employees connect with the individual and the organization. Try these techniques with your leaders to create authentic conversations and make their next town hall meeting a hit with employees. Greet employees as they enter. This is a time for face-to-face conversation with leaders. Don’t waste the opportunity. The presenter and others should shake hands with employees, thank them for coming, and let them know they are appreciated. Invite new employees to stand and give them applause. Do this at the start of every town hall meeting. Choose a suitable time frame. Introduce new leaders or people who will interact with many employees. Talk about company growth. Don’t read slides. Use images and talk about the slide topic in an authentic, conversational way. Give an example, highlight a challenge and how it was met, and put the information in context. Explain what it means for the future. This requires leaders to know the topics and practice their presentation. Recognize teams and individuals who have had big successes. Explain why their success is important. Use this example to highlight company values and direction. Tie it to the company vision. Ask employees to applaud those being recognized. If your town hall meetings don’t have several celebratory rounds of applause, you are missing great opportunities to engage. Mention social media that highlights successes. Ask questions. For example, say, “By a show of hands, how many …” Have someone note the results and use that informal polling to help guide future engagement. Don’t be afraid to express surprise at the reaction, and let employees know what you think about the response. That will show you are listening authentically. Tell an anecdote. Leaders who tell a story about their experience at the company and how it relates to the current situation appear more authentic and help employees understand who they are, which can strengthen relationships and build trust. Show a movie. Highlight new products, employees who put company values into action, customer testimonials, advertising campaigns, volunteers in the community, or anything that includes employees doing great work. Keep it light and under two minutes. Give swag to employees who ask questions. It’s not easy to ask the first question. Reward courage by giving the first person to ask a question and others something of value: branded merchandise, gift cards, time-off certificates, etc. Be prepared with seed questions to start the Q/A session if nobody steps up. The presenter can say, “Some of you may be wondering…” or “A question you might want to ask is …” Be creative with questions that encourage discussion about what’s on employees’ minds at the time. Repeat the question. To make sure everyone heard the question and to confirm the presenter understood it, repeat or summarize the question, then answer it clearly. If appropriate, ask, “Does that answer your question?” This helps everyone know the presenter is listening. It also helps those taking notes for follow-up. End on a high note. Don’t end flat. The presenting leader should always end by mentioning something positive and encouraging, then thank everyone for the work they do and for making the meeting a success. Philip Hanyok, COTP, has more than 15 years of corporate communications and marketing experience. He helps leaders and organizations tell their story, promote their brand, and improve engagement. 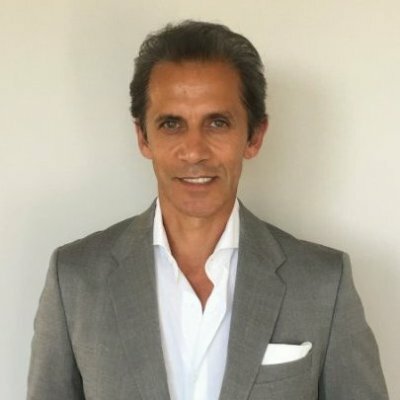 Philip’s expertise is broad and includes internal/employee communications, company intranets, marketing websites, public relations, executive speechwriting, town hall meetings, digital signage, executive messaging, crisis communications, project management, social media, magazines, and newsletters. I recently received the following email from a reader of my TechSmith Camtasia 9 (Windows): The Essentials book. I am really enjoying your Camtasia 9: The Essentials eBook that I purchased on Amazon recently, but I have run into a problem regarding how to extend the duration (pages 58-59) on the Timeline. I followed steps 1 and 2 on page 58 for the logo, but when I attempted to change (by typing) the Duration from 5 seconds to 20 seconds, I got the screen message “Please enter a number between .1 and 5,” and the time can’t be extended beyond 5 seconds. I am also attaching a screen shot so you can see the actual message. I have tried grouping the items as directed on page 59 and then trying to extend the duration in that manner, but that method doesn’t work either. I am using Camtasia Version 9.1.2. Any suggestions you might have would be appreciated. I was able to replicate this issue on my computer, but I found this strange because when I wrote the book, the Duration feature worked just fine (changing the Duration of a Timeline object pushed items on the same track to the right). I reached out to TechSmith support and received the following reply (and the fix). Sorry for the delay – I wanted to confirm some information with the Camtasia team first. This change was a deliberate change made in Camtasia 9.0.1. The reason for the change was because of feedback that we were receiving from users, which was (as Matt mentioned) that projects were getting out of sync when extending frames and durations. So, this change was implemented, and we also published this tutorial with best practices on using ripple move and extend frame (similar to duration). https://www.techsmith.com/tutorial-camtasia-ripple-move-and-extend-frame.html I am really sorry for any trouble this change has caused! Please let me know if you have any questions. Whew! It's good to know that I'm not losing my mind. To get past the Duration issue, press the [shift] key on your keyboard and manually extend the playtime for the object on the Timeline (instead of using Duration feature). You can still use the Duration feature if there is enough space to the right of the selected object. For instance, you'll need a little over 5 seconds of space if you want to increase the Duration of an object by 5 seconds. Otherwise, you'll see the same error reported by the reader above. If you're an Adobe Captivate developer, here are some awesome new classes that are laser- focused on Variables and Advanced Actions. Each of these 3-hour classes are taught live, online, and are highly interactive. If you need to share an Adobe Presenter presentation with another developer, you’ll find the Presenter's Package tool very useful. Presenter projects begin as a single, self-contained PowerPoint presentation. You can transfer them from one computer to another without worrying about leaving a part of the presentation behind. 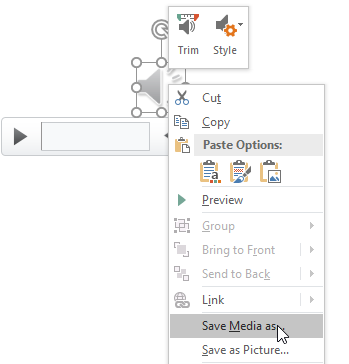 However, once you add audio or videos assets to a PowerPoint slide via the Presenter tab on the PowerPoint Ribbon, those assets aren’t embedded into the presentation. Instead, Presenter creates a folder that houses those assets every time you save. Should you forget to include the assets folder when you send the PowerPoint presentation to a colleague, the person opening the presentation will receive alert messages about missing files as Presenter attempts to load the assets. When you package a Presenter project, everything a developer needs to open the project is included in the package (except for the actual Microsoft PowerPoint or Adobe Presenter software). A developer simply needs to double-click the prpkg file they receive from you to extract all of the project assets into a self-contained folder. 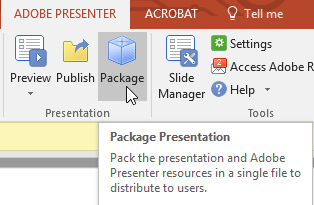 To create a Package, from the Adobe Presenter tab, Presentation group, click the Package tool. Click the Browse button (the three dots) and select a folder for the package. Click the Pack button and you're done. As mentioned above, the prpkg file contains everything a fellow developer needs to make changes to the project (assuming they have both PowerPoint and Presenter installed). 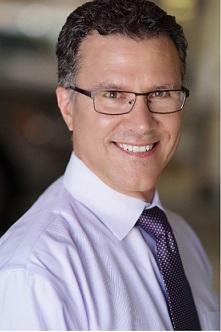 Kevin Siegel, CTT, COTP, is the founder and president of IconLogic. 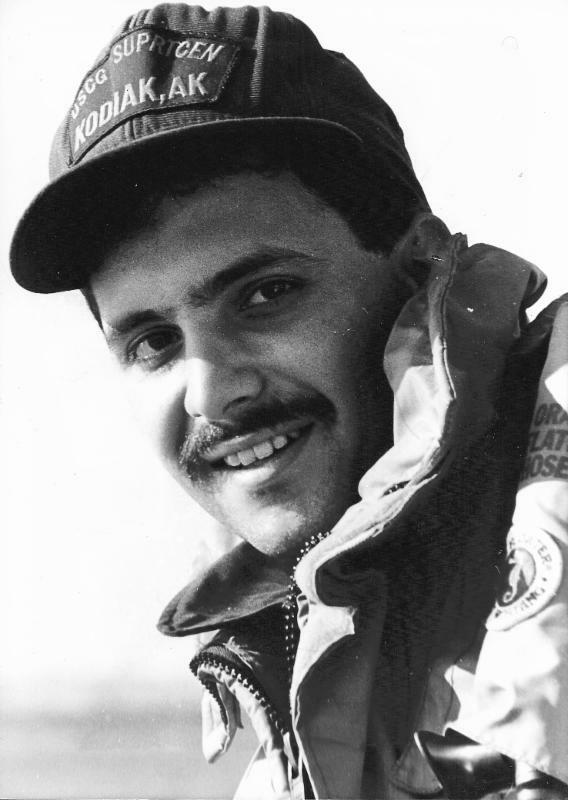 Following a career in Public Affairs with the U.S. Coast Guard and in private industry, Kevin has spent decades as a technical communicator, classroom and online trainer, public speaker, and has written hundreds of computer training books for adult learners. He has been recognized by Adobe as one of the top trainers world-wide.